The current system of digital advertising for connected devices is dysfunctional. It’s complicated and inefficient. 50% of ad spend is wasted on middleware and mediation, stolen by fraudsters, or otherwise lost. It’s unsecured and lacks standardization and transparency. XCHNG is the open and unified blockchain solution that will provide stability, security, efficiency and transparency in the digital advertising industry. Today, marketers are stuck with a complex, centralized technology path to customers. The decentralized model of XCHNG simplifies through peer-to-peer buying and selling. Leveraging a Blockchain standard for digital advertising removes the intermediaries and allows buyers and sellers to transact directly. 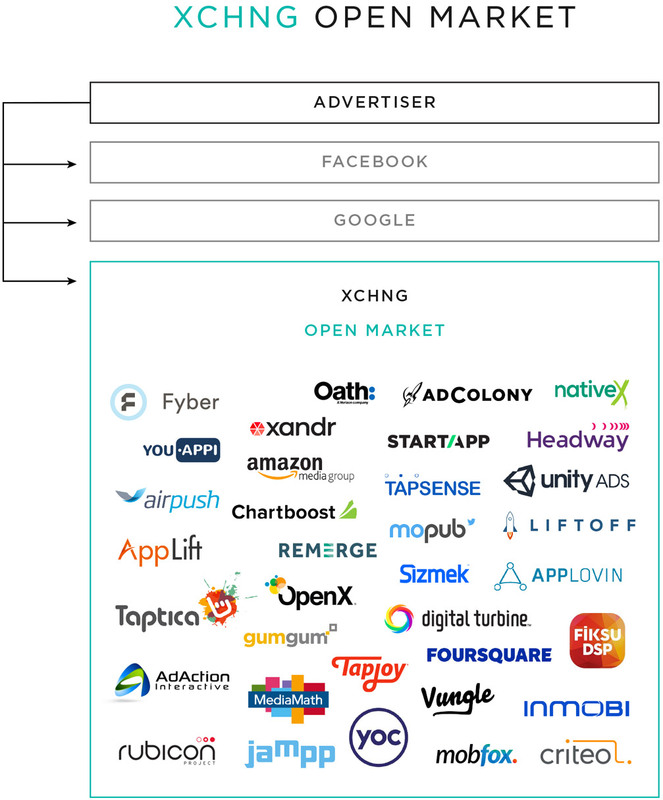 The XCHNG framework will bring five key improvements to digital advertising. It will 1) facilitate the workflow of buying and selling ads through a smart contract IO; 2) enable the related targeting and activation of audiences; 3) bolster ad-spend efficiency and security; 4) facilitate the adoption of a next-generation advertising system-of-record for all participants; and 5) tokenize the framework to treat digital ads as a true asset class. The Insertion Order (IO) is the binding contract between a publisher and an advertiser. The current, paper-based IO is rife with inefficiencies and lacks a mechanized verification process for contracted commitments. Further, the plurality of secondary actors (such as DSPs, SSPs or Data Brokers) delivering on the terms of the IO provide enormous opportunities for fraud. Agency trading desks, exchanges, and ad networks buy, sell and trade ad inventory, but none of this activity is automated for standardization or scalability. It is rarely verifiable, integration across the system is terribly inefficient, and there is no common mechanism to provide liquidity. In 2015, Kochava created a new targeting platform for mobile audiences called the Kochava Collective. Now the largest mobile data marketplace in the world, this unified audience graph enables advertisers to query and target audiences with device-level precision for their campaigns. Based on this targeting, the centralized system enables de-duplicated distributed activation to best address the audiences identified through the targeting process. While the Kochava Collective was built as a centralized system, the strategic implementation of the Kochava Collective on XCHNG will transition the technology to a distributed audience graph based on the publisher inputs on the XCHNG distributed system. This approach opens the opportunity for competition from others against the Kochava Collective, but it also enables wide-scale adoption for XCHNG, and primes the pump for the value of the system across the industry as existing advertisers are already buying at scale using the Kochava Collective as their targeting toolset. In today’s digital advertising landscape reliance on independent actors makes efficiency a challenge. An advertiser must discover inventory, settle on terms, buy through various channels, ensure that the inventory is not fraudulent, and verify that delivery was performed. Independent media sources and ad networks have long desired to have a direct connection to the market demand. The manifest combination of the XCHNG framework and the XCHNG Token represent a solution to enable true market dynamics at scale—available to any participant in the model, including buyer, seller, discovery, exchange, market maker, broker, or property. An open, decentralized, blockchain-based framework enables a universal system-of-record for all participants in the advertising ecosystem. XCHNG has built-in capabilities which account for the operational realities of digital advertising and support the requisite components for the ecosystem to evolve from the current centralized approach. Being OnXCHNG means being “blockchain enabled” and using the open, common system of record for all digital advertising. Because XCHNG enables Insertion Orders to be codified to smart contracts in the XCHNG distributed ledger, the unification of terms, delivery, measurement, rating, and payment are under a common technology approach. By leveraging crypto tokens which represent transactions on XCHNG, advertising can be treated as a true asset class with tradability, traceable resale, and liquidity. While there have been several efforts to unify the concepts of blockchain technologies and digital advertising, we believe that none have addressed the end-to-end nature and none are backed by a company with the experience and relationships that Kochava Labs already has in the advertising industry. Blockchain, in its peer-to-peer nature, is a very egalitarian, very open playing field. XCHNG is designed to be open for third-party verification, but also provides industry-leading measurement right out of the box from Kochava Inc. XCHNG is also able to leverage the Kochava Collective, the largest independent data marketplace, comparable in scale to the biggest players in the field. As a 1st reference implementation of a Measurement Provider, XCHNG is enabled to serve the world’s top advertisers and Fortune 100 companies, who depend on Kochava Inc. to measure over $6 billion in ad spend annually.